What is the Oxford Online Placement Test? 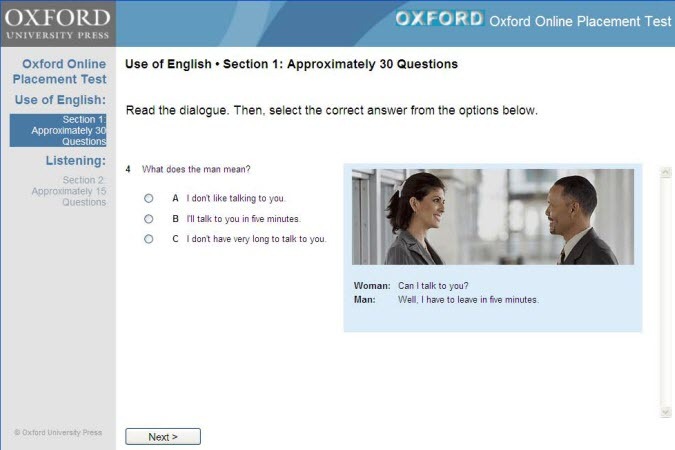 The Oxford Online Placement Test measures a test taker’s ability to communicate in English. It gives you the information you need to find out about a person’s language level. By using this test, you can concentrate more on using the information it provides, and less on the time-consuming process of administering the test and marking it. is online, allowing test takers to take it anywhere; at home, at school, in the office, and under examination conditions if you choose. is automatically marked with instant results. tests either British or American English; you select the variety of English tested, and the mix of accents, when you assign the test. tests more than just grammar and vocabulary. It also tests a person’s understanding of meaning when communicating in English. tests pre-beginner students with tasks specifically written at A0 (Pre-A1) level and reports these scores on a scale of 0-0.9 so you can differentiate between students. is reliable (consistently grading test takers at the right level) and valid (having a strong theoretical basis and having been through a rigorous test design, pretesting, and piloting stage). reports scores aligned to the CEFR, but also allows you to add your own score interpretation if you so wish. is computer-adaptive, making the test short, yet still accurate. is easy to manage using a Learning Management System that does what you need in a few straightforward steps. provides easy to use online tools to help you put test takers into classes or groups according to their level. What exactly does the test measure? It measures a test taker’s ability to understand a range of grammatical forms and the meanings they convey in a wide range of contexts. It also measures the extent to which learners can use these language resources to communicate in English language situations. The Common European Framework of Reference (CEFR)Can Do language descriptors. Current thinking on the nature of communicative language ability. Current thinking on how foreign languages are learned. The grammar and vocabulary included in Oxford University Press ELT coursebooks. The types of errors that language learners typically make as they progress towards native-like ability to communicate in another language. For a more detailed consideration of these test design issues, download the paper The Oxford Online Placement Test: What does it measure and how?by Professor James Purpura of Columbia University, New York. Professor Purpura has led the research and design team working on the test development project. He is a prominent figure in the field of language assessment, having written and lectured widely on the subject. His book, Assessing Grammar (CUP, 2004) is of particular relevance to the development of the Oxford Online Placement Test. How does the Oxford Online Placement Test work? 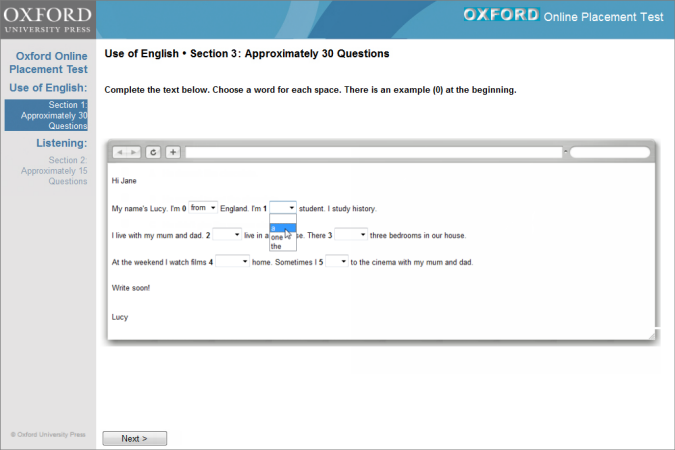 The Oxford Online Placement Test is a computer adaptive test. This means that it adapts to the ability level of each test taker, and only presents them with questions that are at his or her appropriate level of difficulty. It does this by estimating the ability of each test taker after they have answered each question and then selecting the most suitable next item for them to attempt. By using an adaptive test delivery format, the Oxford Online Placement Test can be much shorter than a conventional, paper and pen placement test since each test taker only answers questions relevant to his or her level of language ability. Using this computer adaptive approach, each test taker is taking a test that is uniquely designed to measure his or her ability level within a certain domain (e.g., knowledge of grammatical forms). Crucially, the difficulty level of these items has already been determined through pretesting involving thousands of students from around the world and through prior statistical analyses. In this way, items can be precisely matched up with test takers’ abilities. What task types are used? The Use of English section is designed to measure how much learners know about grammatical forms and the meanings (e.g. word meanings, phrasal meanings, sentence meanings) that these forms encode. When you assign the test you choose whether to test either British English or American English. You can vary this each time you assign the test, depending on your students' needs. Use of English consists of three task types. Task 1 is designed to measure a test takers’ knowledge of grammar. In this task, test takers are asked to read a short gapped dialogue and then complete the dialogue by selecting one of four options. An example is shown below. Task 2 is designed to measure a test takers’ ability to use grammatical forms in order to understand the meanings communicated in a short, minimally-contextualized exchange. The meanings vary on a scale from very explicit, where the meaning can be determined from the words in the sentence, to very implicit (also referred to as “implied”), where the meaning of the exchange can only be determined from the context. Being able to understand not only the words of an exchange, but also their collective meaning(s) as intended by the speaker in context, is a critical feature of being able to communicate in a language. This item tests the learners' understanding of intended meaning. Here the statement "Have you seen the newspaper?" is a somewhat indirect way of saying "Where's the newspaper?". Task 3 is designed to test whether test takers can understand a long passage with gaps and whether they have sufficient knowledge of grammar and vocabulary to complete these gaps correctly. In other words, this task type was designed to measure a test taker's knowledge of both grammatical form and meaning. Task 3 asks test takers to read a gapped passage and to complete the passage by selecting one of three options from a drop-down. This makes the test fairer to pre-beginner students who are anxious about spelling their answer. Since difficulties with spelling won’t affect a student’s ability to take the test, you can rely on the accuracy of the results in the time taken column. Example: Testing knowledge of grammatical form and meaning across a passage at A0 level with multiple choice. For detailed information on the task types for pre-beginner test takers download our paper: The Oxford Online Placement Test for A0 test takers by the ELT Assessment Team at Oxford University Press. The Listening Section of the test is designed to present test takers with different types of listening passages. They will need to identify the literal, intended, and implied meanings being communicated in what they hear. In other words, test takers need to understand what is said (literal meaning) in the passage, what is understood “between the lines” (intended meaning), and what is communicated “beyond the lines”, drawing on the individual, social, cultural, affective, or attitudinal meanings of the situation. The Listening Section contains three task types. The first presents test takers with a number of short dialogues, each followed by a single four-option multiple-choice question. The second task type presents test takers with a longer dialogue; the third with a monologue. After test takers listen, they are asked to answer one or two four-option multiple-choice questions. Test takers are given approximately 15 listening questions, depending on their level. They may listen to each recording twice. 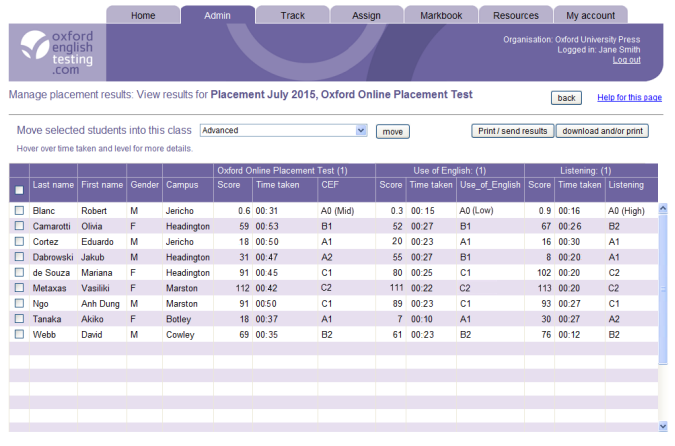 How do administrators or teachers administer the Oxford Online Placement Test? You can manage the testing process using Oxford English Testing’s Learning Management System (LMS). This system provides you with a comprehensive tool set that, for example, allows you to create different groups/classes for testing and then takes you through a simple set of steps for assigning placement tests to these groups. Tests can either be taken in your institution’s computer lab with your colleagues overseeing the session, or at the test taker’s home. As the LMS allows you to send multiple emails at the click of a button, you can provide test takers with the URL of the login page along with their unique login and password details so that they can take the test at their convenience. 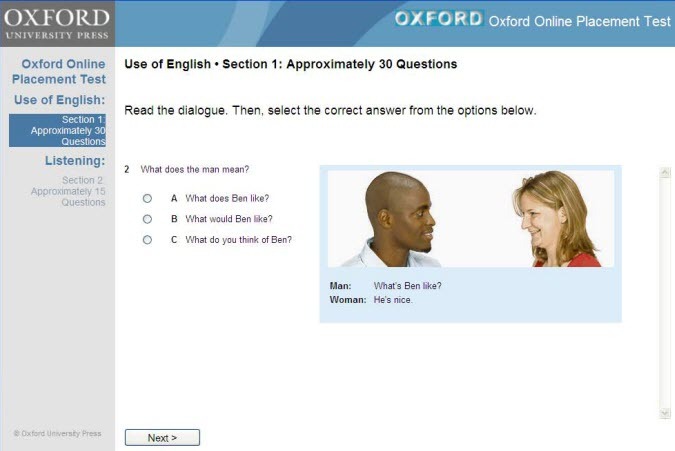 Can the Oxford Online Placement Test test both British and American English? The Placement Test now tests both varieties of English. 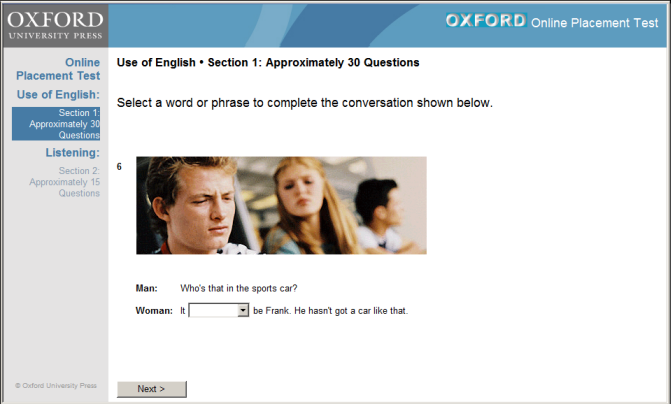 When assigning the test, you first select either 100% American or 100% British for the Use of English section. The content of each variety has been developed separately by British English and American English writers. A 50/50 mix of British and American accents. The variety of English used in the Listening depends on the accent of the speaker. Questions using American accents will be in American English, and British accents will be in British English. The selection is made when you assign the test, and you can change your selection each time, depending on the students you are teaching. Having a mix of accents reflects the way learners of English now use and experience the English language. How long does the Oxford Online Placement Test take? You can give students any time between 50 and 90 minutes to complete the test. Our research shows that most students finish the test within 50-60 minutes, and that no student should take more than 90 minutes on doing the test. The default time allowed is 90 minutes. Students see the timer counting down, and they get a warning 15 minutes before their time runs out. During the Listening section they can only play the audio twice. This helps them finish the test within the time set. When the time finishes, the test stops and the questions are automatically marked. The Markbook shows when a student has not finished their test. The Status column shows Timed out. The timer stops if the student's internet connection goes down. It then continues when they log in again. If you have low level students who may take longer than average to complete the test, we recommend you leave the timer to the maximum 90 minutes. Students must answer all the questions in order to get an overall score. If they have finished the Use of English section they will get a score for that section. If they do not finish the Listening section, they will not get a score for Listening, and they will not get an overall score. This is because students need to have completed all the questions for a section in order to get a reliable result for that part of the test. They also need to have completed both sections in order to get a reliable overall result. The test taker’s results show how long he or she has spent on each section of the test. You might want to use this information to place students with similar results into distinct classes when one has completed the test much more quickly than the other. scores on a scale of 0–120 (giving equal weighting to the two sections). decimal scores for test takers scoring below 1, and a description showing where they are within the A0 (Pre-A1) level: low, mid or high. information that test takers have provided themselves at the start of the test. optional information that institutions enter. You can then sort the results by clicking any of the column headings (e.g. by score, CEFR, gender, etc. ), lock that column and sort by a different column. Then you can select the test takers and move them into their class within the OLMS. You can also download the data in Excel, and print class lists for teachers to use. The placement test results are reported on a scale of 0–120 with 20 points corresponding to each CEFR level (e.g., a score of 15 would correspond to the CEFR A1 level). For test takers scoring below 1 at A0 (Pre-A1) level, you’ll see a score range from 0-0.9 with decimal scores to help you differentiate between pre-beginner students and to know how close to A1 level a test taker is. For detailed information on how to use placement test scores and on what analyses this score interpretation is based, please download the paper The Meaning of Oxford Online Placement Test Scoresby Alastair Pollitt. Alastair Pollitt is a member of the UK OFQUAL Advisory Committee, a visiting fellow at Cambridge University’s Research Centre for English and Applied Linguistics, and is internationally recognised in the field of educational measurement. 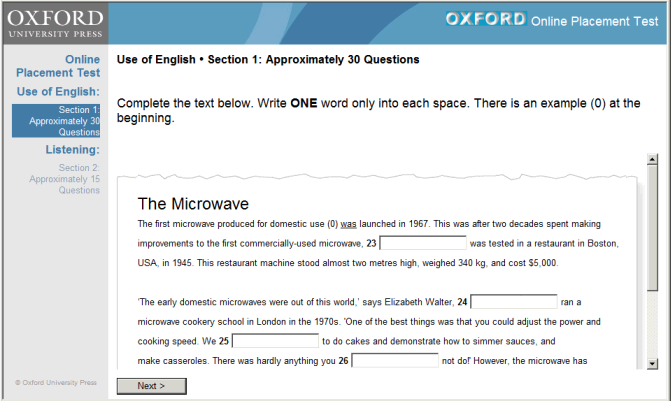 The Oxford Online Placement Test has a unique bank of tasks for low level test takers written at A0 (Pre-A1) level. The task types are specifically tailored to assess the language ability of pre-beginner students, making the test fairer to these students. The tasks have been pretested by pre-beginner students so you can be sure that your students are tested with tasks at the appropriate level of difficulty, giving them the confidence to answer the tasks and complete the test. For test takers scoring below 1 you’ll see scores ranging from 0-0.9. You also get a description of their position within the A0 level according to that score: low, mid or high, helping you to better understand your pre-beginner students and to know how close to A1 level a student is. The decimal scores and descriptions are shown in the online Markbook. They are also displayed on the Teacher’s Report Card and Student’s Grade Card. You can use the decimal scores and A0 level descriptions to differentiate between groups of pre-beginner students. Then place your students in a class, using the results to guide your teaching plan. The test algorithm presents test takers on the borderline between A0 and A1 with tasks from both levels, so you can be confident that the final level is calculated accurately. The Oxford Online Placement Test has been developed to measure test takers’ communicative language ability so that the scores from the test can be used to make accurate placement decisions in a language programme. The validation process for the design phase of the Oxford Online Placement Test began with an extensive programme of research. The initial phases involved an analysis to determine what content might need to appear on the test. Further item and test analyses were performed based on a pretesting stage that involved approximately 10,000 students from 42 countries. This ensured that the test is both appropriate and fair for test takers from different ethnic, cultural and linguistic backgrounds. In examining claims of the quality of the test, the statistical characteristics of the items, the measures, and the pretest forms were investigated from a number of approaches. You can find more information on reliability and validity in the papers by Alastair Pollitt and Professor James Purpura. Testing vocabulary, grammar and the understanding of meaning in a conversation. Testing the understanding of meaning in a conversation. The test has been pretested and validated by thousands of students in more than 60 countries. So you can be confident that the results accurately reflect a student’s English level. You’ll get more than just a level to help you place students in different groups. You can also add your own questions to the student's registration form. Their answers will appear in the online Markbook. You can choose what variety of English - British or American - to use in the test, or even to present a mixture of the two in the Listening section. This makes it adaptable for different groups of students. Can be taken anywhere with a broadband internet connection. The test adapts to a student’s answers, giving them a more difficult question, or easier question depending on whether they get the answer right or wrong. This makes the test short, yet still accurate. Just create a group to be tested, assign them the test, and sit back while the results come in. They log in using details they’ve received in an email, or have been given on paper. They answer a few registration questions.